Yes, that's right. When I'd scrambled past the tangerine in my stocking I pulled out an interesting looking box. Yes... He'd even gone to the trouble of wrapping it! "Oooh I wonder what this could be?" I said pulling off the paper. 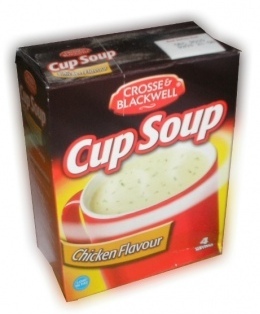 You can imagine the look on my face when I opened it, can't you - I don't even like chicken soup! I explained this to my other half to which he replied in all seriousness "Oh no! I've wrapped the wrong one, you should have got Vegetable." A fit of giggles followed. That'll teach me to be present hungry!